Heart’s Sentinel is the first book in the Terra’s Guardians Series, and the debut novel of PJ Schnyder. In this post-apocalyptic world, shape shifters have moved outside of the cities and taken up to living in the wild. The humans who fear them have stayed in the cities they built. Mackenzie was happy living her life in the city when she meets and begins dating Van, a shape shifter living in the city. When he stalks and attacks her, changing her info a shifter, she moves herself out of the city and into the River Cap Pride. Adam is a pack Sentinel and assigned to help Mac in her adjustment to the life as a shifter. When an instant attraction flames within him, he must fight both his desires and against Van to keep Mac safe. The two begin to form a bond as Adam helps Mac learn all about being a shape shifter, both the plus and the minuses. In addition to the threat from Van, there is also the unknown threat of the “hunters.” These mysterious people have been stalking the shifters and humans alike. Their technology is advanced, their tactics are brutal, and their motives are unclear. The pack has been trying to gain more information about them, and both Mac and Adam encounter one looking for blood. I really enjoyed this story. The world-building was great, the plot was fabulous, the characters well thought out, and the overall story was engaging. The world that Schnyder has built, with the humans living in fear in their closed off cities, the shifters doing everything they can to restore nature back into the world, and the questions surrounding the hunters is all incredible. This series reminds me a little of the super popular Psy-Changeling Series by Nalini Singh. There are so many plot lines all interwoven together to make the story fun and keep the reader guessing the whole way through. I only hope that we see more and more of the River Cap Pride as the series continues! I loved the relationship between Mackenzie and Adam. Many times with shifter couples, they are mated and suddenly in love with no problems to work on in their relationship. This was totally not the case with Mac and Adam, and I loved them for it. They both had to deal with facing the fears of their pasts in order to move forward to a future together. Adam does everything in his power to give Mac time to adjust to the life as a shifter, and I enjoyed watching Mac struggle with both her desires and fears. I also liked that Mac didn’t put up with Adam’s BS. Although she worried about adjusting with her new life, she also refused to be treated as a child. She was strong when she needed to be, and at the same time was soft when appropriate. I absolutely loved her character. While Adam picked at my nerves a few times, especially when treating Mac like a child, he was the perfect Alpha Male Shifter I’ve come to love. He protects what is his, and is always putting others needs ahead of his own. I can’t wait to read more in this series, and discover some of the secrets behind the hunters. While we only learn a little about them, I was hooked with what little information was given. Are they just killing shifters and humans outright? Are they studying them? Kidnapping them? Are they some kind of aliens from another planet? I can’t wait to find out more! The dynamics of the pack were great as well. I love how close-knit everyone was, and again it reminded me so much of the Psy-Changeling series. The alpha with his sentinel soldiers, charged with protecting the pack at all costs. The value the pack places on its children and juvenile, the healers with their special brand of magical healing. I can only hope that we see more of Marcus the alpha, Chryssa the healer, and Mack another sentinel. There were one or two editing mishaps that seemed somewhat obvious to me, and I hope were caught before the book went to print. As I had a review copy, I can only hope that the last round of edits fixed these small snafu’s. Keep your eyes out for Red’s Wolf a short novella set in the Terra’s Guardians world, featuring Carri, a woman escaping the confines of the city with the Glacier Valley wolf pack, and Jason the lone wolf who has his sights set on claiming her. This short is set for release on August 30, 2010! 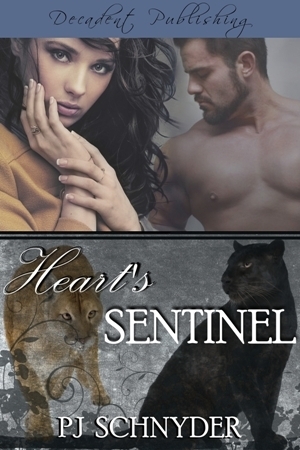 All in all, I give Heart’s Sentinel 4 out of 5 cat shifters! P J, the big roll continues! This book has captured the attention of so many already. I know there’re a lot more to come. Congrats and best wishes from Thailand.